A substantial and very enthusiastic audience turned out yesterday afternoon to hear the the Romeros at Sunset Center in Carmel (the third time they have appeared for the Carmel Music Society). It was a gala, season-opening occasion with guitarist Terrence Farrell playing softly in Sunset’s lobby, plus a post concert lovely reception with wine and sweets that included an opportunity to meet the artists. Well, there is no doubt that the 2014-2015 concert season has truly begun. The Carmel Music Society launched its new season yesterday afternoon with an exciting concert by the Romero Guitar Quartet, consisting of Celin, Pepe, Lito and Celino Romero, in a program of Spanish, Italian, and Brazilian masterpieces. Brasil Guitar Duo Wows Us! Every once in awhile we encounter musicians whose playing is so perfectly conjoined, matched, polished and perfected that we are drawn into the music and become a part of it. This happened last July when the Carmel Bach Festival presented its Thursday evening concert – “Baroque to Bluegrass.” The magicians who mesmerized us on that occasion were Caterina Lichtenberg and Mike Marshall, two wizards of the mandolin, whose delicate control of an awesome variety of beautifully shaped sounds and phrasing was every bit as impressive as their blazing virtuosity. This same phenomenon happened last night when “Music at All Saints” presented “Brasil Guitar Duo” at All Saints’ Church in Carmel. The two magicians who held us in their spell during this concert were classical guitarists João Luiz and Douglas Lora, whose mastery of their instruments is so effortless and natural that their virtuosity merely reinforced and enhanced the glorious music they produced. Angel & Nefretiri Romero — Spanish and Flamenco Charm! The Carmel Music Society launched its new season yesterday at Carmel’s Sunset Center with an afternoon of Spanish and flamenco music. 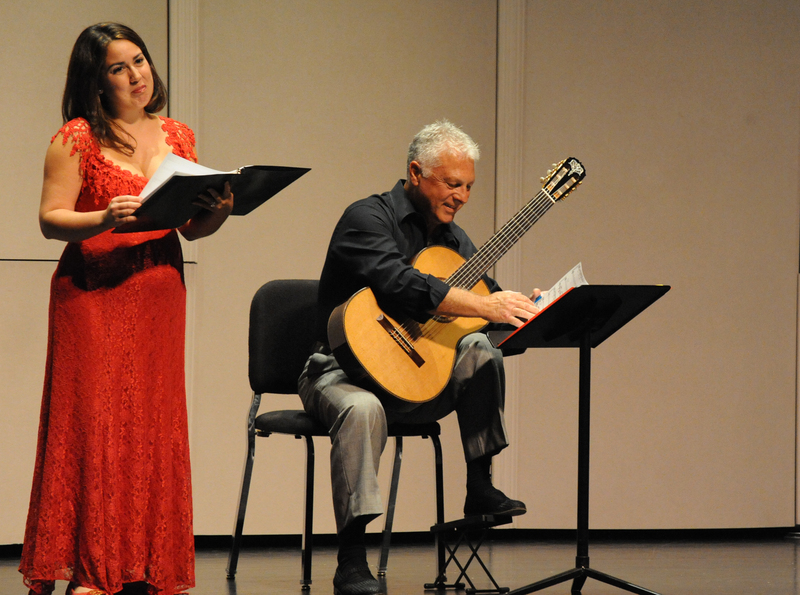 On hand to dazzle us with a program of mostly unfamiliar fare was Angel Romero, guitar, and his wife Nefretiri Romero, mezzo-soprano. After arriving on the Monterey Peninsula from Hawaii, and feeling unwell, Nefretiri was unsure whether she would be able to participate in the afternoon’s program. Accordingly, Angel Romero prepared to play a solo recital, but as the day wore on, Nefretiri recovered enough to go ahead with her scheduled part of the program. Guitars, Guitars, Guitars – The Romeros! Â Â Â Â Â Â The Carmel Music Society pulled out all the stops last night as it opened its 2008-2009 season with a highly successful concert at Sunset Center featuring the fabulous Romeros â€” â€œThe Royal Family of the Guitar.â€ The gala event began late in the afternoon with a reception and festive dinner across the street at the Carmel Womenâ€™s Club.